The Best Gaming night you can imagine! Every Gaming System - Xbox 1, 360, Xbox - Play Station 4, 3, 2 - Wii U, Wii - Nintendo, Game Cub, Nintendo 64, Sega Genesis, Atari + More! Play all your favorite games all nite long! All games in HD & wireless - played on 70" to 45" Flat screens! Monthly Competitions for Cash & / Or Bartab & prizes - Play for Fun! Smash Bros Head Quarters! Every Wednesday- Melee - Project M - Wii U Super Smash!!! Amiibo Wars! Feel free to bring in your own Wired & Wireless Controllers & Games! It's a Party: Pinnacle Party! All Pinnacle Vodka Mixed Drinks are $5.00 All nite long!It's a Pinncale Party so Enjoy some of the most delicious flavors around! 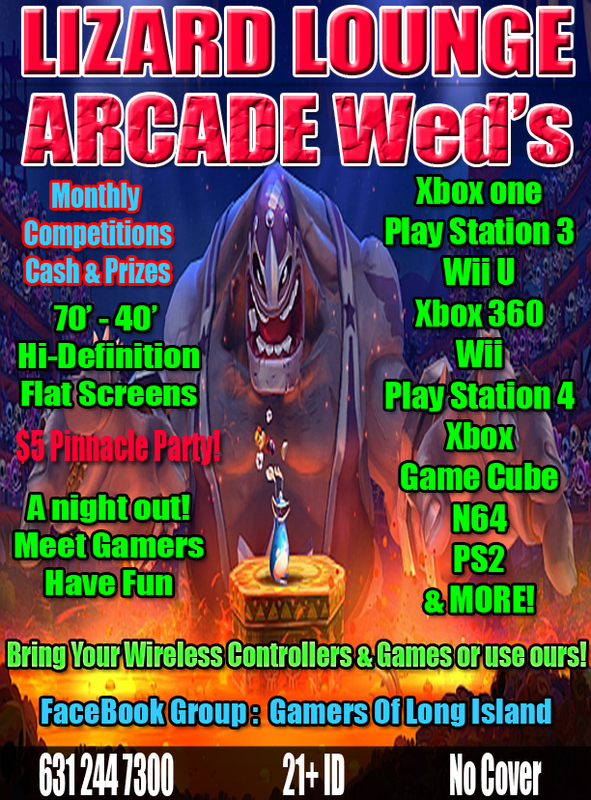 Pinncale Party at Arcade Wednesdays !! Lizard Lounge is a sophisticated & trendy Club & Manhattan styled LoungeClub with cutting edge audio visuals comparable to the hottest clubs in Manhattan & Miami. Don't be fooled by the unassuming entrance facade. Step inside & be prepared to be awed by the spectacular video wall, multitudes of special Lighting FX & a crisp power packed state-of-the-art sound system, comparable to any big city night club. This 2500 sq ft. hot-spot features an industrial cieling & retro-modern decor. Every Wednesday the place comes alive with party people of all walks, especially nice & friendly citizens of Long Island & beyond. Definitely worth coming early.DJ Music & Karaoke & Sports played all night long!!! Fun all nite long! No attitude, just fun times with friendly people! So much Fun at 1 place & 1 night, all for NO COVER. Yes it's absolutely FREE to get in. Always 21+, No ID No Entry. Click LizardLounge@gmail.com to e-mail us. Call the club at 631-244-7300 for further info. Call for info on Parties and bookings! Have your Next Birthday Party Here at Lizard Lounge....You'll have a BLAST!